What is Safe and Healthy Play? Get hundreds of games used in more than 1,000 Playworks schools and Playworks-trained organizations across the country! The Playworks staff has found, created, and sorted hundreds of games that will get kids off the sidelines and having fun. Whether you are looking for games that will keep kids active for a full recess period or just want to do a few minutes of ice breakers before an activity, there’s a game here for your needs. 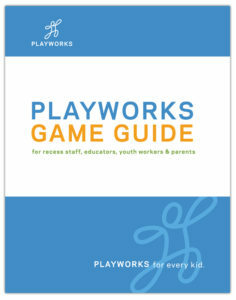 Share your information below to receive a free PDF of our full Playworks Game Guide.